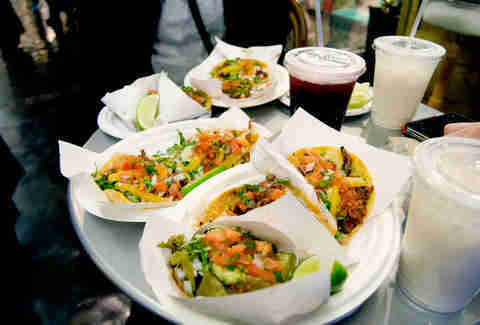 West Coasters have long ridiculed NYC’s taco scene, but we’ve come a long way as a taco town over the last few years. Here, upscale nouveau taco experiences coexist alongside venerable food trucks trading in tripe, tongue, and delicious al pastor dishes. And, in a blind taste test, you’d be hard pressed to separate the better from the best. Fortunately, we’ve road tested them for you. 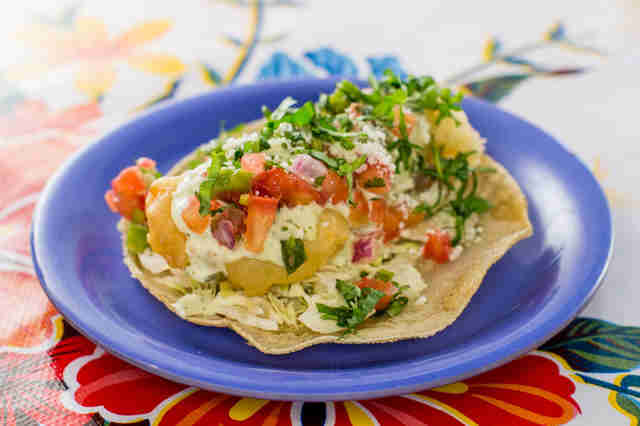 Here are all of the tacos you must try in New York City right now. There aren’t many things that will get New Yorkers to trek out on the 7 train for an hour-long wait. Casa Enrique is one of the few. Chef Cosme Aguilar has garnered a cult-following for his simple and traditional Michelin-starred Mexican fare, like slightly sweet and nutty mole and zesty carne asada. 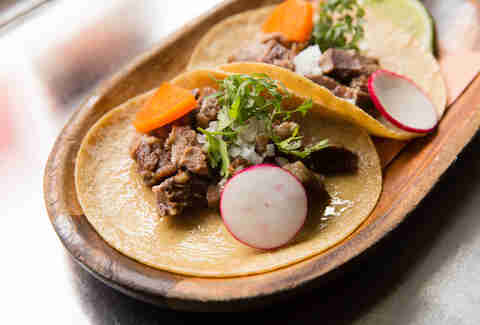 But it’s the lengua (beef tongue) tacos that stand out the most. The slow-cooked beef tongue is aromatic and almost creamy in texture, balanced by chewy corn tortillas garnished with contrasting cilantro and crisp onion. The line for this Chelsea Market taco stand tends to snake around the room on weekdays, when hordes of nearby office workers line up for house-made tortillas. Your choice of either the corn or flour variety is used to encase fillings like tender carne asada and well-seasoned pollo or nopal (grilled cactus). 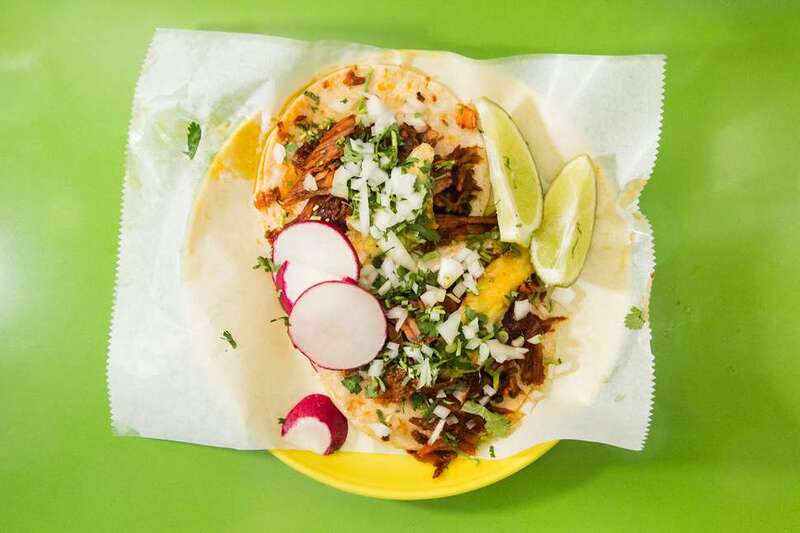 But the must-try meat is the adobada: The pork is steeped in a slightly sweet, chile-scented marinade before taking a long, slow turn on a rotating spit. Once it’s ordered, the charred, crimson meat is sliced straight off and onto a warm tortilla bed, paired with slices of pineapple, salsa, and other traditional accoutrements. 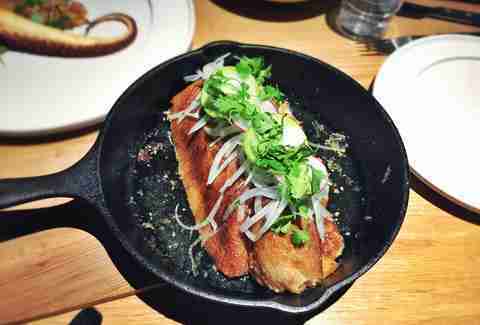 Cosme is not your average taqueria, and its $94 duck carnitas certainly aren’t your average tacos. But they’re worth the special occasion splurge -- or anytime someone else is paying. Acclaimed chef Enrique Olvera and chef de cuisine Daniela Soto-Innes take nearly four days to prepare their birds for the shareable dish. At points it's cooked in evaporated and condensed milks as well as Mexican coke. The result is flavorful, tender meat covered with crisp, browned skin, served as a whole hunk. Guests shred the block themselves, then place the slivers of fowl into warm house-made tortillas, DIY-style. 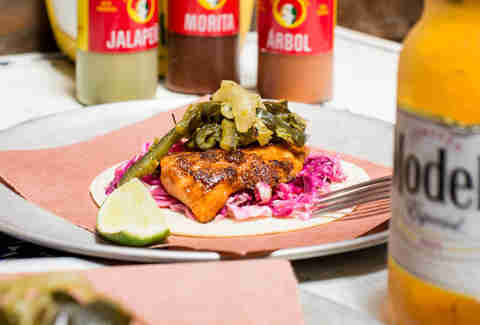 La Morada isn’t known for tacos; people trek to the Oaxacan restaurant in Mott Haven mainly for its rich and complex moles and other regional specialties. But the tacos deserve higher praise, mainly because of how beautifully simple they are in comparison to everything else on the menu. Two soft corn tortillas get stacked with options like chicken, skirt steak, carnitas, al pastor, chorizo, and bistec asado. 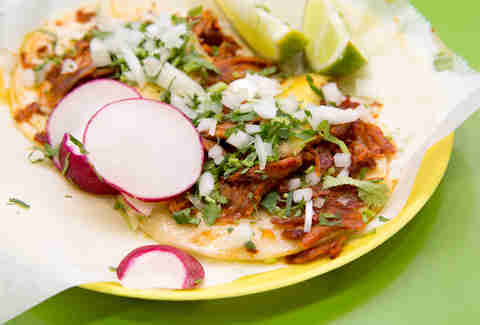 The move is to go with the spicy pork, which is juicy and bursting with chile. Don’t forget to layer on a generous serving of the smoky, spicy, house-made chipotle sauce. This Sunset Park restaurant (and two corresponding food trucks) has developed a highly dedicated group of fanatics -- mainly for its tripe (which can often times feel like chewing through leather, but here it’s nearly as soft as Cool Whip). But the tacos shouldn’t be overlooked. In fact, it’s hard to choose from the different varieties: The al pastor is sweet and tart; the chorizo is spicy with just the right amount of grease; the cabeza (veal head) is smooth and more flavorful than most other meats. Best of all, you don’t have to choose. 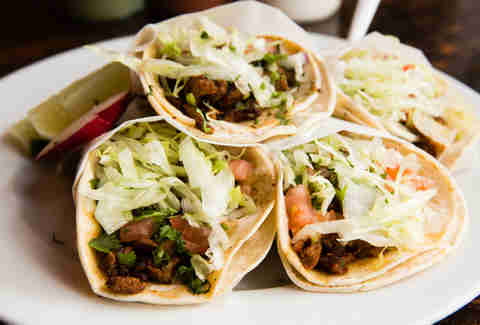 The campechanos tacos combine multiple meats in one tortilla, doled out according to the chef’s whim. The beauty of the enormous al pastor spit at Taco Mix -- an East Harlem taqueria with a big window open to the street -- tends to halt passersby in their paths. 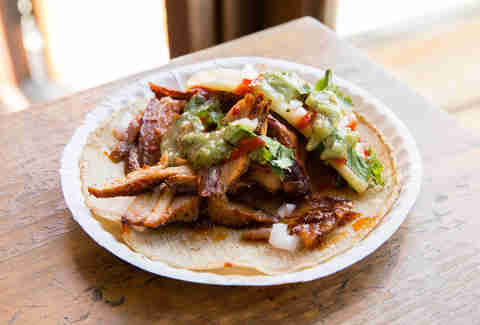 After you order, watch the taquero shave off the charred stack of marinated pork into a warm tortilla. Marinated in 10 different spices and roasted slowly on the spit, the al pastor tacos here are some of the city’s most flavorful and traditional. Some of the city’s most popular Mexican restaurants source their masa (the nixtamalized dough that’s used to make tortillas) from this Queens factory. It was the first tortilleria in the city to use fresh kernels in the masa-making process, but you can bypass the middleman with a visit to its brightly colored onsite cafe. Here, freshly made dough is pressed into faultless tortillas, topped with all manner of traditional fillings. For the camaron, sautéed shrimp is topped with a refreshing mix of mango and cilantro and is served with chipotle mayo salsa. It’s smoky, spicy, and fresh, and sure to temporarily transport you to a seaside getaway -- until you walk back outside and hit the concrete. Sara Ventiera is a writer for Thrillist. She has endured multiple bouts of the meat sweats. Scarlett Lindeman is a Thrillist contributor.